It’s time to take hardwood quality further. Malibu Wide Plank presents a gorgeous Maple in wider and longer planks, each hand-stained for a far more vivid color depth than machine-stained hardwood. Unlike rotary peeled veneer, sliced face offers straight wood grains and gives you a premium solid wood look. Hand rolled edges and ends complete an unprecedented allure. Choose from 6 trend-setting shades from whitewash to earthy grays to browns - all sealed with 6 layers of the latest super low gloss urethane finish, providing protection from every day wear. This product is available in elegantly stable engineered tongue-and-groove construction, a minimum of 50% of planks in each case will be full 74 in. lengths. Surface texture features a beautiful elegant wire brushing. Backed by a lifetime residential warranty, Malibu Wide Plank is Lacey Act compliant and Carb 2 certified for your safety, it has also achieved the highly coveted FloorScore certification which is the most recognized indoor air quality (IAQ) certification standard for hard surface flooring materials, adhesives and underlayments. It qualifies for many green building standards including LEED v4, BREEAM and CHPS. Malibu Wide Plank - here to expand design possibilities. 23.31 sq. ft. per case and case weight: 36.82 lbs. 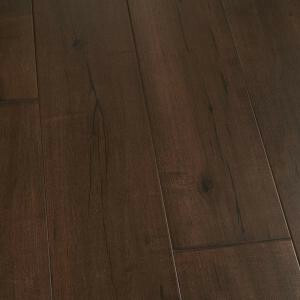 Buy online Malibu Wide Plank Maple Zuma 1/2 in. Thick x 7-1/2 in. Wide x Varying Length Engineered Hardwood Flooring (23.31 sq. ft. / case) HDMPTG060EF, leave review and share Your friends.